Consulting a medieval book was challenging—they could be very heavy and half a meter wide (more than 1.5 feet) when open. c. 330 - 1300 C.E. 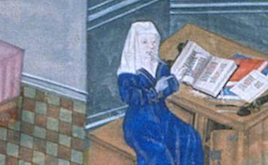 At medieval universities, students took notes on parchment scraps, sometimes bound together with cord. Manuscript readers tracked marginal comments with dots, lines, letters, and numbers—anticipating the footnote. From cupboard shelfmarks to bookcase inventories, medieval readers devised codes for locating precious volumes. Lose your place? Not in a monastic library. Static or dynamic, “spider,” or wheel, these bookmarks stay put. Scribes left plenty of empty space, but readers often filled the margins with comments—and even little hands. A carousel, a wheel, or a portable desk? Reading multiple books at once required ample space and custom furniture.